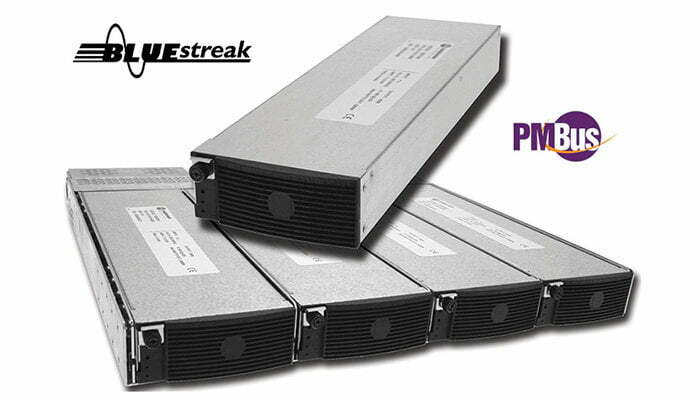 The BLUEstreak TBSR3000 is a hot-swap, modular 1200 Watt 12 Volt AC-DC Front-End. The TBSR3000 1200 Watt 12 Volt AC-DC Front-End is ultra-compact with a power density of 12 Watts per cubic inch. Companion 19/23-inch 1RU rack-mount power shelves hold up to four modules which can also be operated in a 3+1 redundant mode. The modules have automatic load sharing and output ORing diodes so they can be hot-swapped while the system is operating. The TBSR3000 1200 Watt 12 Volt AC-DC Front-End output voltage can be controlled by 0V to +5V analog input. Green LEDs indicate AC and DC power good. The TBSR3000 1200 Watt 12 Volt AC-DC Front-End also has control and monitoring features and a +5V & 1.8A and +12V @ 0.8A standby outputs. Operating temperature range is -20°C to +70°C. 1. Models showing two output power levels with dual AC input ranges will operate over the full range from 85VAC to 264VAC, automatically limiting output current according to the actual input voltage range applied. 2. All units also operate from 90-420VDC, taking into account the same conditions as note 1. 3. Input currents shown are nominal values at 120VAC/240VAC as appropriate. Blanking kit for unused position, order pt. no. 775-1501-0000.